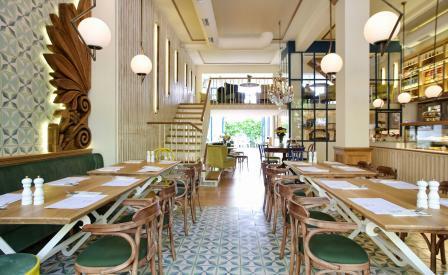 Thessaloniki-based architects Minas Kosmidis have designed a chic neighbourhood restaurant in Athens for first-time restaurateur Ntoumis Konstantinos who, after years of managing eateries for other owners, has struck out on his own. Located in the affluent suburb of Kifissia, the café slots neatly into the locale’s leafy streets, and the design complements its surroundings to a tee: the airy main dining room is adorned with updated homages to classical Greek architecture, such as patterned mosaic tiles and a sculptural antefix carved from solid wood, while mismatched chairs create pops of colour and visual contrast. A mezzanine and inner courtyard at the back modelled on old Athenian houses provides shelter from the thrum of the street outside, and is the perfect setting to enjoy a light assortment of dishes from a menu overseen by acclaimed Greek chef Dimitris Skarmoutsos. Commendably, local cheeses and cured meats, plus ingredients for traditional pies and tarts are sourced exclusively from small-scale Greek producers. The restaurant’s loyal clientele however, return for relaxed breakfasts of scrambled eggs and cinnamon-spiced tomatoes with handmade Zea bread, a heritage recipe that has enjoyed a recent surge in popularity due to its purported health benefits and gluten-free credentials.